Athletic Bio (Major accomplishments, races, times, distances, years in sport(s), etc. ): My main sport has been soccer – from age 3 through college. I play recreationally now, so I have played a total of 23 years. I also played basketball in high school and ran cross country in grade school and high school. 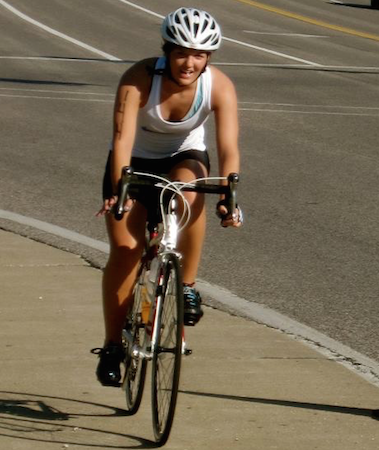 I enjoy cycling – have done the Bike MS ride in Columbia, MO several years. Completed my first century ride in 2013. I placed in the top 5 in my age group. I’ve done one sprint and one Olympic distance triathlon, but both were done several years ago and for completion, so I did not pay much attention to my times. I’ve run two half marathons – my first was through the hilly city of San Francisco and I finished in 2 hours. My second was around that same time – I was on pace to set a PR before my training was interrupted by a soccer injury. I’ve done several road 5 and 10ks and one 10k trail race. Why do I compete: The athlete in me enjoys competition and accomplishing things that are challenging for me. Racing goals (2016 and future): Successfully train for and complete my first half Iron Man. After my first one, I want to continue to compete in these races with more emphasis on improving times. For my first one, I just want to finish. Other interests: Hiking, skiing, snowshoeing, being outdoors. Best advice for newbies: I am a newbie so I welcome advice!